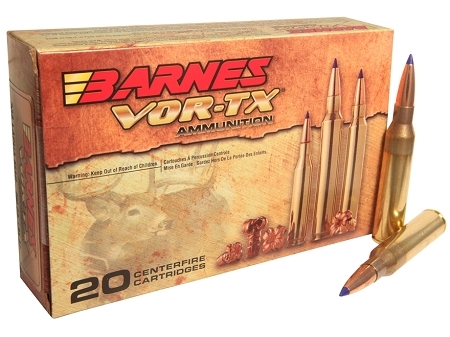 Barnes bullets have historically had the reputation of offering quick, clean and humane kills. Now they are taking their highly regarded bullets to the next level loading them in ammunition. The LRX bullet design increases Ballistic Coefficient values by increasing ogive and boat tail lengths to improve the bullets' long-range ballistic performance. For the hunter who is confident in long-range hunting, the LRX will fill the niche of this new hunting craze. LRX bullets will continue to be manufactured with the proven 100-percent copper, lead-free bodies. The bullet's polymer tip initiates expansion, causing the nose cavity to open instantly on contact doubling the bullet's original diameter while creating four cutting petals that wreak extensive internal damage. Exceptional performance means clean, quick kill. VOR-TX ammunition is manufactured to precise tolerances to ensure excellent accuracy and consistent velocities. This ammunition is new production, non-corrosive, in boxer-primed, reloadable brass cases.